Sophisticated hybrid Diaper Clutch for either cloth or disposable diapers and wipes. For cloth diapers, carry a spare clean diaper in the wet pocket, and switch out with the dirty. Our sealed, waterproof, stink proof lining will keep that mess contained until you get home. Keep spare liners and cream in the pleated dry pocket. For disposables, keep 2-3 diapers in the pleated dry pocket + creams, and wet wipes in the sealed, waterproof pocket (loose or in their packaging dispenser). Machine wash when needed. 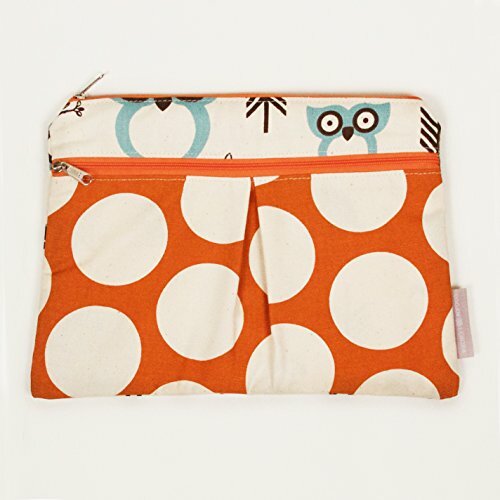 We recommend Sophisticated Diaper Clutch for either CLOTH or DISPOSABLE diapers and wipes. CLOTH diapers: Carry a spare clean diaper in the wet pocket, and switch out with the dirty. Our sealed, waterproof, stink proof lining will keep that mess contained until you get home. Keep spare liners and cream in the pleated dry pocket. DISPOSABLES: Keep 2-3 diapers in the pleated dry pocket + creams. Wet wipes stay fresh in the sealed, waterproof pocket (loose or in a dispenser). Machine wash when needed. We recommend washing on cold and air dry to keep colors vibrant. Additional uses: cloth wipes, cloth pads, breast pads, or toiletries.